There are questions in Civil Service Examinations that may require you to compare fractions or even arrange them in order. In this post, I am going to teach you three strategies in comparing fractions. Which is greater, 5/7 or 8/11? 1.) You multiply the denominator of the fraction to the numerator of the other fraction. 2.) Place the product above the numerator. The larger product is the larger fraction. 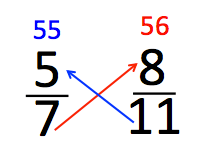 As shown in the example above, 56 is larger than 55, therefore, 8/11 is larger than 5/7. Sample Question: Which is the largest: 13/16, 5/8, 3/4? We can get the least common denominators of these fractions. Now, the LCM of these denominators is 16. So, we convert everything to fractions whose denominators is 16. To convert 5/8 to something over 16, we divide 16 by 8 then multiply by 5 which gives us 10. So, 5/8 is equal to 10/16. To convert ¾ to 16, we divide 16 by 4, then multiply by 3. This gives us 12. So, we have converted all fractions to fractions whose denominator is 16. We have 13/16, 10/16, and 12/16. Obviously, the largest is 13/16. Note that using this strategy does not only tell us which is the largest. In fact, we can order the fractions from smallest to largest or vice versa. Which is larger: 2/5, 3/4, or 7/10. We can convert them to decimal by manually dividing the numerator by the denominator (watch video above). The equivalent of 2/5 = 0.4, 3/4 is 0.75 and 7/10 = 70. The strategies above can be used effectively by looking at the fractions. If two fractions are compared, use Strategy 1. If the numerators are not very large, you can use strategy 2 or 3.